After years of playing the role of genius for hire to countless bands, including The Cribs, Modest Mouse and of course, The Smiths, Johnny Marr has finally released an album under the solo banner. Luckily, the latest in a long line to be crowned Godlike Genius by the NME has kept all of his bet ideas for himself. The Messenger encapsulates everything great about his body of work. The record feels like a tidy summation, a musical CV showcasing what he does best. And of course, what Marr does best is play guitar. The man who has often been credited with birthing the modern indie sound has excelled on this album. From the Squire esque cascading riff of title track “The Messenger” to the northern soul rythm of fantastic opening track “The Right Thing Right” each song is fresh, inventive and surprising. Never predictable. It becomes entirely more impressive when one considers a man who has been in music since the 80s is still churning out more innovative sounds than some of the up and coming bands on the scene. While the fretwork is impressive, there was a worry the album may fall down lyrically and vocally. Luckily, this is not the case. Marr has as much of an ear for a vocal hook as he does a guitar one, as showcased in songs such as “Generate! Generate!” A rousing Marr era Cribs style tune. Lyrically Marr has just as much to say as his previous songwriting partners. The album as a whole conveys a theme of apathy and disconnection with life. In a time when social networks and X Factor seems to dominate the public, The Messenger really connects. If you happen to be a fan of Marr and his previous body of work, you will love this album. If you’re looking for a fresh sound wrapped up in a catchy collection of tunes, you will love this album. If you’re looking for a Cilla Black cover, this album will not be for you. In fact, music in general probably isn’t for you. Sorry. 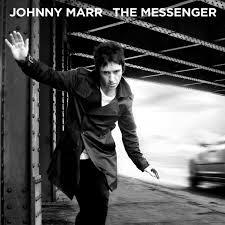 It’s took long enough by far, but Johnny Marr’s first solo effort is a standout album, and a great start to 2013.